For the best in "Be seen" gear, get your own Alamo Ammo Hunting Hat. The front is this hunting hat has AlamoAmmo.com. This is a 100% American Apparel Hunting Hat. 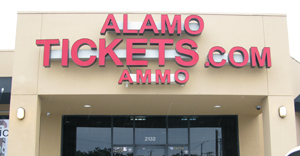 Alamo Ammo is local to San Antonio and will ship Alamo Ammo Hunting Hat TAN/Camo within the US. Local Ammo Sales can be picked up at the office and get great discounts on Alamo Ammo Hunting Hat TAN/Camo as well as saving on shipping.